Nearshore reefs are found along many of Florida's beaches, often in less than ten feet of water. The reefs are important developmental habitat for sea turtles, especially juvenile green turtles who forage on the algae that grows there. With such close proximity to land, nearshore reefs are the first to be impacted by coastal construction, beach renourishment, and erosion control projects. To ensure these reefs and the sea turtles that depend on them aren't affected, permitting agencies require multiple years of sea turtle monitoring at the project locations. In recent years, two different methods have been developed to monitor and count the number of sea turtles in nearshore waters. In the first method, two snorkelers towed behind a boat, act as observers (Photo 1). This method is often frequently referred to as “shark-fishing” since the snorkelers resemble giant fishing lures as they are towed behind the boat. Each time a snorkeler spots a turtle, they alert the boat and someone on board records the observation. 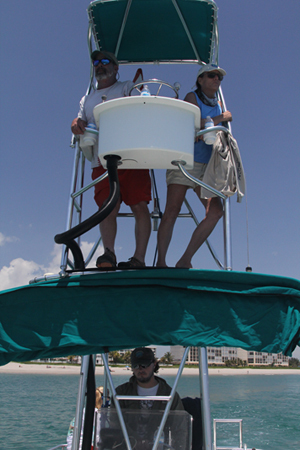 The second method is tower-based, where observers sight the turtles from atop a tower on the boat (Photo 2). As the boat moves along, the observers look ahead for turtles. When a turtle is sighted, they record the observation. Both methods are capable of determining the relative abundance of turtles, allowing for comparisons over time and between different locations. However, the methodologies are not directly comparable and each method may have unique strengths and weaknesses. In order to examine the differences between the methods, Inwater Research Group, Inc. (IRG) and Florida Atlantic University's sea turtle lab (FAU), with financial support from the National Save the Sea Turtle Foundation, spent a week on the water comparing the shark-fishing to the tower-based survey methods. To directly compare the methods, they were done simultaneously as the IRG research vessel was capable of supporting both a team of shark-fishing snorkelers and a team of tower-based observers. The survey sites were sections of the nearshore reefs in Palm Beach and in Broward Counties. Each group separately tallied their sea turtle counts for later analysis. while snorkeling behind the research vessel. Inwater Research Group biologists search for sea turtles atop the research vessel's tower.